Not so many years ago, I had a turning point in my writing career. An “Aha!” moment. Something made me remember it yesterday and I wanted to share it here—to show how you might think you’re going one way down a certain path you’ve carved for yourself, but in fact there’s another path carved for you. There it is, waiting, glimmering in the near distance. It was your true path all along. This story is about how I became a YA writer, because I didn’t start out as one. So there I was, starting my new job at a new publishing house, being my Copy Editor Self and pretending my Writer Self didn’t exist. My boss was this great guy I was excited to work for. And my first couple weeks on staff were spent getting the hang of things, and picking up projects that the other, more experienced production editors had started, so I could learn from what they did. One of the very first projects assigned to me by my boss—the first novel, in fact—was to do work on a book by Laura Kasischke. The manuscript had already been copyedited and prepared by another production editor. My task was to simply check the manuscript pages against the bound galley layouts, just to make sure no text had dropped out. I wasn’t even supposed to read it at this stage. Just make sure everything was in place so ARCs could be printed. A very simple, very quick job. And yet I started reading. And then I couldn’t stop. 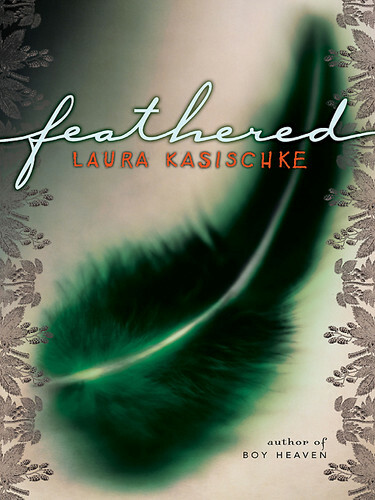 This book that I was assigned to work on that week was Laura Kasischke’s second YA novel, called Feathered. And it changed my plan for myself as a writer. Simply put, it changed my life. Interesting that my boss had assigned me this particular book to work on… like he knew me or something. But still. I’m sure he didn’t want me reading the whole book right then! All he wanted was for me to do the bound galley check, make sure there were no major problems, and move it along. There would be time for a full read later—maybe not even by me, since I was so new. But something happened to me when I was working on those pages. I read and I remember very clearly looking up, straight into the sun shining through the office window, lighting up my new glossy wooden desk and the bright white proof pages, thinking, I didn’t know a YA novel could be like this! Thinking, What if—and this would be the first moment I’d consciously think this—what if I wrote a YA novel, too? The book utterly stunned me. After I finished Feathered, I immediately borrowed Laura Kasischke’s other novel from off the office shelf—her first YA novel, Boy Heaven, first published in 2006—and this book would stun me even more. Everything changed for me after devouring Boy Heaven, something fired up inside me that was personal and growing and growing until it took me over. I was so inspired. So excited. So full of… possibility. This, a great change after the low point I’d hit trying to write—and rewrite and rewrite and rewrite—that manuscript I was working on in my off hours—one that was, in fact, my second attempt at a novel for adults. I’d never told myself that I should write a YA novel before this, even though I’d done work-for-hire writing for kids to help pay my bills. “My” writing was for adults, I’d thought, even though I always wrote about teenagers and from young voices. Writing YA had really never come up—not in all my MFA workshops, though it seems so obvious now. (There wasn’t a YA concentration, or even classes on writing YA, at that time in my MFA program, so I guess that’s why it never came up.) All I can say is that it truly hadn’t occurred to me until I read Laura Kasischke’s novels. Reading Laura Kasischke would lead to more eye-opening YA-fever moments: Story of a Girl. Lessons from a Dead Girl. Sweethearts. The Blonde of the Joke. Paper Towns. Months after this, an editor friend who worked upstairs began to lend me YA and middle-grade books (I won’t call her out, but if she reads this, she’ll know who she is). Soon enough, I’d discovered Thirteen Reasons Why. Wintergirls. When You Reach Me. And more. More, more, more. I now know why that novel I was endlessly, hopelessly revising when I started that day job was so stalled: I wasn’t supposed to work on it anymore. There was a reason I couldn’t get a break. I was supposed to do something else. This. This. I have my former day job—and my boss, who assigned me that fateful bound galley check—to thank for this. And Laura Kasischke, a poet and a novelist for both adults and young adults—and, so you know, it was hearing about her new adult novel, The Raising, a novel I must get and devour immediately, that sparked this memory. Whenever I think of Boy Heaven and Feathered I know them as the books that raised the question in me. The challenge. What if I write a YA novel? That was the day this whole new path made itself known to me. The very one that turned me into the writer I am today. So tell me: Have you had a turning point in your writing life, too? Was there a surprise moment that sparked it? Psst. 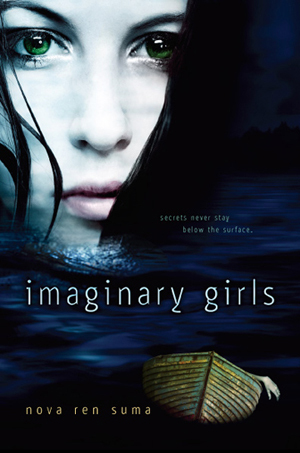 You can still enter my giveaway to win a signed ARC of Imaginary Girls. You have till Monday 11:29 p.m. to leave a comment on this post and you’re entered. Some commenters below have asked what it was about Feathered that struck me so. I’ll tell you if you’re curious: First it was the voice—two girls so distinct, their voices perfectly woven together and contrasting. Feathered is about a girl who goes missing on a spring break trip to Mexico—but just giving the one-line plot does nothing to explain the magic of this novel. It was told in intersecting chapters, between two girls: the one who disappears and the one who’s left behind. At the time, I was writing a novel (the dead novel) told from two intersecting voices, so I was very intrigued by the two sides to the story. But also it was the language of Feathered—the dreamlike quality of the writing. The poetry of the words. When I say “I didn’t know a YA novel could be like this,” I meant I didn’t know the structure could be so experimental, that the subject matter could be so dark, that the wall between realistic and fantastical could be blurred so much, that I didn’t have to pick a “genre” and there wasn’t one box a novel had to be shoved in. I meant that the world of YA fiction was—and has since proven to be—so much more expansive than I’d ever imagined, and I encourage writers and readers who are wondering what I mean to open their minds and seek out the incredible books that are being published as YA (i.e., “young adult”) today. 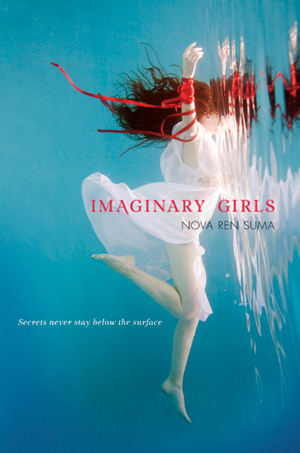 There is literary YA (I’m not afraid of the L-word), which I think my novel Imaginary Girls is just because of the kind of writer I am and always have been, and there is every combination and incarnation between. I love when fiction breaks boundaries and shrugs off labels. Feathered does this, among so many other incredible YA novels I’ve come to discover and love these past few years. And that is why it spoke to me on that fateful day. Thank you so much for all these comments sharing your own turning points in your writing lives. I love reading about them. And thanks, especially to WordPress, for featuring this post on Freshly Pressed yesterday! Such an honor! Next Article Who’s Your Book For? My turning point came when I was eighteen. I had been trying to get published writing romance novels for about five years by then (so so very bad) and I hadn’t read a YA novel since I was ten or eleven. My niece was born, and I decided to check out some of the books I vaguely remembered loving when I was younger, to put in her nursery. So I ordered Tamora Pierce’s SONG OF THE LIONESS Quartet off Amazon. They arrived, all bright and shiny, and I couldn’t resist having a flip-through…and the next thing I knew I had been struck my lightning. The turning point in my writing career was my divorce. As surprising and astounding as it was, it awakened my inner voice. Now I write about my experience on my blog, and I feel a deep sense of GRATITUDE for my ex and his new wife. For without them, my voice may still be in hiding! My turning point? A part of me says I’m still waiting for it. But I guess one turning point was the moment I realized I could BE a writer–I’d only written ONE story at that point. But I sent it off to ZYZZYVA (the only litmag I’d ever heard of). 4 days later, Howard Junker mailed me an acceptance letter! my turning point hasnt happened yet…but reading this certainly helps to inspire! It is rare to hear (or read in this case) someone say “This book changed my life” and mean it. I’ve said it before and people just kind of brushed me off. “Oh, then its a good read then?” Is the response I’d get. I think the books that come along and literally impact you as a person, a writer …as a woman are really special and need to be noted and told. This was a great post. Amazing story. Great Story. me neither but you have certainly added a list of titles to my reading list. i wish you had also talked about what exactly Laura wrote about. And how it inspired you. I edited the post to talk more about the novel that inspired me so much! Thank you so much for asking. When my now agent said my book was definitely YA it was a real lightbulb moment. I was straight down the library, taking out every YA title going and lapping them up – as you said, Nova, I’d no idea a YA novel could be like that! So in my editing of my MS I had a clearer idea of the reader in mind and my passion grew from there. Lots of YA books get marketed as ‘Crossover’ in the UK – so I’d unwittingly been reading a fair amount of YA fiction already, Meg Rosoff really standing out in my mind. It felt like the pieces fell into place. What an inspiring story! I’m thankful for your “Aha” moment! Congratulations! The turning point came in the past couple of months. I’ve dove into writing on my site, along with my novelette series, Miscorrection. Have I had success? It depends on how you look at it. By sales numbers, defintely no. By just the fact that I’m writing consistently, yes. And that’s what matters to me. So happy you’ve found your “niche.” I’m sort of finding myself evolving from “story writer” to “life analyzer” in my work. It’s just — observing life, exaggerating small things and beautifying details makes me happier and more fulfilled than any other writing endeavor I’ve ever undertaken. Blessings to you! I sincerely hope that you prosper in all of your doings and aspirations. I hadn’t thought about writing for a career whatsoever as i went through my younger years in school, and even through most of college i hadn’t given it even a second thought. It wasn’t until my final year in college, when i had already chosen “Acting” as my major and had no way to turn back, that i garnered any hint of a notion that i might be able to be any good at this writing business(or have any fun with it, which is a huge personal requirement of mine). Hastily I scrawled (typed) a short story on irony, the requirement for the assignment that the story needed to include, that i KNEW to be just plain crap (I didn’t separate the paragraphs, I didn’t properly punctuate, I had run on sentences, I made it far too short — basically a guaranteed fail), as i didn’t really have the time to make it “Good”, or even any better, but really i didn’t care how good it was, i just wanted to hand in something. So i just let my brain do it’s thing, in warp speed, and i didn’t try to muddle the process with my peevish stabs at proper grammar (why is English so hard? I still have trouble to this day! ), i just got it done. A week later i received no grade. The teacher instead pulled me out of class into the hallway to accuse me of plagiarizing. Now, one might think that this slight would have been a deterrent to a young impressionable mind who respected his elders (and i do/did), but to me it was quite to opposite 🙂 I had just been complimented. It’s funny — because this paper (with a fresh reworking/edit), is my blog today, and you brought it up. Editing is still my biggest problem, and i’ve got a novel like you’d had, which seems doomed to be forever edited, but I just wanted to share my “Turning Point”, and say hello. Nova! This post just made me all teary. I have always loved knowing how much you loved Laura’s work–just like me! So gratifying, rewarding, and satisfying to hear that others were as affected by those books as I was. And so wonderful to know that those books have played a part in your own amazing work. Tara, Thank you so much for commenting here! I truly love Laura’s work, and feel so connected to her books because of that moment I had first discovering her. Thank YOU for helping to bring her YA novels into the world… so readers (and writers like me) could fall so deeply in love with them! if that former boss were to read this post, he would probably say something like, “i had it planned all along.” he might remember that within minutes of first meeting you he knew you had something special inside. he might want to tell you how immensely proud he is of you. he might want to tell you yet again how he was driven to tears by an early draft of “imaginary girls.” and he might want to thank you for stirring a turning point inside of him to get back to that thing he’s been wanting to do since forever. but that’s only if he read this, of course. …Maybe he did plan it. Maybe he subconsciously knew it would make a difference? Did I ever figure out what his superpower was…? IS THIS IT? I’m especially excited to hear about the turning point having to do with something he’s wanted to do since forever… cannot wait to find out. Writing my blog was my turing point. Instead of the travel memoir I thought I was meant to write, I found my voice as a humorist and finally- finally, started working on a novel that came more fluidly and naturally than any other I had ever attempted. Thanks for the excellent post and for reminding me to think about what got me to where I am in my writing. I never really aspired to be a writer. I always wrote–bad poetry, long letters, disjointed short stories–but I never thought about writing a novel. From my perspective, novels were for reading. The only reason I ever started writing a book was because I was frustrated one day that I didn’t have anything to read. It would never happen now, I have an e-reader and I’m not afraid to use it. I have developed a little bit of a writing habit now, though. So I think I might write another book or two. Blythe: Um… I’ve started reading THE FREAK OBSERVER (which I’m sure you’ll hear about offline, so I can gush to you in private) and I am absolutely struck by it. So… I (along with many of your readers I’m sure!) will have to insist: PLEASE write another book or two. Or two dozen. You absolutely can’t stop now. Sorry. I don’t think I’ve had my “aha” moment yet. But when I do I’ll be sure to write/blog about it. but, tell what do you think about this , guys . Is there only one Turning point in our lifes, or maybe two, five… are all those turning moments specials, or some more than others? Good luck on your future novels! For me, trying to retire at 65, was the beginning of my writing addiction. Just because I was 65 did not mean that I could quit being productive. I rented a computer, wrote an article and submitted it to the local paper. I saw my name in print and you know where it goes from there. No big turning point yet. I’ve been writing since I was a young girl and I absolutely enjoy every minute of it, but I still haven’t had my “aha!” moment. After reading this post, I have a slight flicker of hope again that maybe something worthwhile can come from my writing. Thanks for that. Isn’t it funny when you keep hitting your head against a rock that just won’t budge? I agree – you definitely were meant to stop writing that adult novel and delve into the world of YA writing! I would love to write YA novels myself. Someday. But for now I content myself with being a mom of 7 up and coming young adults! Your story was very inspiring. Thank you for sharing! I love moments such as those. It is amazing how little something can be, like a book, and it can change your whole out look on things. I am a grandmother who is very interested in young adult literature. I am happy your blog made the face page of wordpress today and that lead me to you. I am going to the local library to check out the books you mentioned, especially the ones that put you on the road to writing for young adults yourself. I love when people share their “aha” moments. Thank you. I have not had the illusive “aha” moment yet either, but am certainly optimistic that it will make its way to me one day. I like writing for myself. I’ve started a few YA fiction stories and never finished them. I have also written stories loosely based on experiences I’ve had as a child. I connect more with my writing when it is based on what I’ve experienced, and I will continue to do that. It is therapeutic for me and I enjoy it. I am pretty sure I’m not wired for YA novels, so I suppose I can consider that a small aha moment. Congratulations on your success and realizing your calling. I can only imagine what an awesome feeling that must be. My turning point came at the worst time, when there was no turning back. Being in the hospital, hooked to machines, I felt so emotionally shredded; Yet I could not find the words to express the feeling of my soul being detatched from my body. I grabbed a file folder and cheap pen from the table next to by bed and just started scribbling down my thoughts, which turned to hopes, which bloomed into my first poem. That was about two and a half year ago and I’ve yet to stop my manic scribbing, though I wouldn’t have it any other way. Your story was quite inspiring to me, thank you for sharing! I had an “Aha!” moment yesterday too. Isn’t it awesome when something just pops in your head and suddenly everything clicks? Great post. Love aha moments, and thank you for sharing yours. 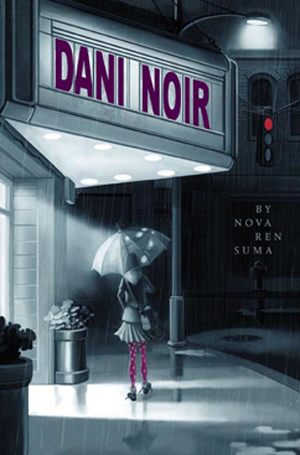 Not to dork out too much, but after I read DANI NOIR the first thing I thought was “I want to write a book like this!” I loved it so much. Still waiting to be published, but I think I know what I want my voice to sound like. P.S. can i get a copy of your book? i’m saying it with a puppy-dog face? What a fun post! Congrats on Freshly Pressed! It deserves it for sure!!! I am a newly published author (non-fiction) and I have had three turning/growing points during this book’s incubation period. First was when I read a book by a scientist who had done experiments that verified the idea I was writing about. As I started reading that book a year ago Christmas, I knew I had found the piece I needed to give my book the solid ground needed to be taken seriously. The next cam this past fall when I missed a family holiday gathering to finish the book and get it uploaded for approval. Throughout the whole book publishing process, I had not given up family time for the book. I thought I should be able to do both. But that night, I was so close, I had been working very hard for several weeks in every extra moment. I knew if I did not finish the indexing that night, it would be at least another week and that just did not feel right! So I gave up my family time on Halloween to spend on my beloved book…a choice that changed the way I viewed myself and increased the respect I had for my book. It also changed way my family regarded the book. Instead of a hobby, it had now become its own living, breathing, energetic Being. The most recent was the day I walked into the local bookstore here in Indy to see my book prominently displayed right alongside books by several people I knew of and admired such as James Redfield, Wayne Dyer, Louise Hay and more! At that moment, I knew that I belonged, that I had hit my mark. All of the study, learning, testing, practicing, teaching and sharing was worth more than I had ever dreamed and my willingness to follow my intuition paid off. That moment enforced to me that my calling was real and the path is mine to blaze! Thank you for the opportunity to share my experience and to remember those moment in writing, so the will never fade away!!! The Best to you! Looking forward to more! Congrats on getting the novel to the best stage of all – on sale. I am writing a novel but I feel stalled on it. But I have other dreams that feel more pressing. Good luck in your adventures as a published book author! I have also been tinkering too long with a novel that no one is interested in. Just to relieve the pressure I started writing a fast and loose fiction blog, with one rule: write a post, wait a day, then hit ‘publish.’ Just getting some sentences moving has helped my writing breathe a little. I think my moment was realizing for the first time that, unlike a novel chapter, a blog entry does not require any emotional investment. I can write for fun again! Maybe one day I’ll write a novel someone wants, but until then, just writing is reward enough. Thanks for sharing this “Aha!” moment with us. I think it”reassuring moment” in my own writing career at the end of last week when I found out that my blog (www.thissideofthecreek.wordpress.com) won an Associated Press Award for “Best Blog.” I would have never expected to actually win and certainly didn’t have the confidence when I submitted the entries to begin with. I haven’t experienced my turning point with my writing, yet. I do believe I have turned away from potential turning point opportunities in the past. Reading your post, however, has my heart beating just a little quicker by a spark of maybe it’s not too late. Thank you for sharing your experience! I look forward to reading more of your blog. I keep writing after work myself. It is interesting to read your experience, it strangely matches part of mine. I had the same moment after reading Hunger Games – I just HAD to write ya!!! You struck off in a new direction. Most people wouldn’t be that flexible. inspiring! still awaiting that ‘turning point’..! What a wonderfully inspiring story! My excuse for, hmm, about two decades now, has been that my day job takes away any creative writing that I want to get done. I have always wanted to be a writer, from a very young age. I maintain a blog and I have an outline of a screen-play that I started two months ago. If, reading your Turning Point today turns out to be my Turning Point for completing my Screen Play, there is no one else who would be happier. I will surely come back and express my acknowledgement and gratitude here. In the meantime, I have managed to keep up the PostADay2011 challenge, with a post or two from the beginning of the year. In any case, a big congratulations to you, and thanks for sharing your Turning Point! I have now marked both your books as to-read on goodreads after stumbling over this post, and your blog, and I am looking forward to reading them! How cool that you have found your voice – congratulations! I only found out recently that Ursula LeGuin’s books (including the Wizard of Earthsea) are YA novels. I LOVE them. I’m brand new to blogging but have always loved writing. Enjoyed your post and look forward to staying connected! You are truly an inspiration to be transparent and bold in your sharing. Most people need a little help to get from point A to point B in any dream they are trying to acheive. Taking a few moments to be honest is the boost each of us needs. My turning point came as a surprise when one morning while washing my hair, I rattled off the start of a poem that would become a children’s story. From that point on, I started focusing on writing children’s picture books, when all my original writing had focused on romantic fiction and chick lit. I still dabble in the fiction, but my goal is children’s books. I love reading urban fantasy and have always wanted to be a writer, but my true turning point came after reading Terry Brooks’ Armageddon’s Children. I just knew that I had to try and write for myself, otherwise I’ll always wonder “what if?”. Best wishes for your book! Hi…we share the same name, Nova.That’s my middle name and how people call me. I like your writing. I have a dream to publish a book someday, but now still strugling with writing. I want to experience that moment you mention above. I also hope to read your books one day. I was so excited to get this comment. I’ve never met another Nova! Perhaps it may sound super cliché, but so far in my 20 years of existence, the most major turning point in my writing came in the form of JD Salinger. I don’t mean Holden Caulfield or The Catcher in the Rye–I mean For Esmé with Love and Squalor, A Perfect Day for Bananafish, and Franny & Zooey. Reading Salinger’s work has forced me to reevaluate the way I write and for whom I write. I got my MFA some years ago at Columbia University. I loved it, and they were the best years of my life, BUT I would not recommend the program if (1) you want to write YA… it’s not the MFA program for that, or most importantly, if (2) you would have to take out student loans to go, as I did. Columbia is extremely expensive, and not as well-funded as other MFA programs, and living in New York City is very expensive if you’re paying your own way (even with university student housing, which I did have). It is a great regret of mine that, as a poor student who could not afford tuition, I took out so many student loans, even after the fellowships I was awarded. I absolutely can’t endorse going into great debt for an MFA in writing… and I am speaking from experience. This is the main reason I would talk most applicants out of getting an MFA at Columbia. Feel free to email me if you want to talk more about it! Best of luck with your MFA search. Actually, I think I just hit mine. I find it funny that I came across your post today because I literally just published a blog entry talking about my first step into realistic fiction. Until now, I’ve never stepped out of the fantasy genre. Not since 2002 when I first started penning fiction. Yet I’m starting to realize this might be the genre I was meant to write after all. My turning point was when I realized that comparing myself to my fantasy writing husband wasn’t being fair to myself. So what if I didn’t have an incredible imagination like his. I don’t write fantasy. I write contempary, witty drama to an audience of moms. Apples to oranges! That’s when I “picked up my pen” so to speak and began writing again. My voice is not his voice, and yet my voice is still worthy of being heard. My Aha writing moment: I’d like to say it happens every time I pick up a pen. But it came after my daughter was born, and I discovered that despite everything crowding into my day, I still wanted to write. Even if I’m never published, I will always write. Sleepless nights, grouchiness, lack of free time…I write through it all. Cool post! I’m really excited to read more of your work. My ‘aha’ moment came when I started blogging, actually. I was really worried about putting my work “out there” … Like you, I’ve worked for years as a copy editor while pretending to myself that the writing wasn’t important. When I began blogging, I finally had to admit it was. You have given me the inspiration to keep trying. My ‘aha’ moment as regards YA novels was when I read “Loser” by Jerry Spinelli. I think he is amazing — the way he connects with the minds of young people. I’ve read many of his books but my favorites are the above mentioned, and “Star Girl” and “MilkWeed”. Congrats on being FP’d — well deserved. Nova, I found your blog on “freshly pressed,” and am glad it brought me here. Wonderful story of inspiration, trials, and triumphs. I’m going to subscribe to this blog. To answer your question, I did encounter a turning point in my writing. I’m a poet and journalist. As a poet, I’m always in the craft, looking for new ideas to explore or new ways of looking at something. I came across Tim Seibles, who’s my favorite poet, after asking a friend’s recommendation on writers I should check out. I googled his poems, read them and was hooked! His use of humor to explore complex issues of race and social justice is amazing. He uses persona poems in the voice of popular cultural icons as Bugs Bunny and the Road Runner to drive his message home. To make a long story short, my first collection, Drift (Aquarius Press), which will be published in January 2012, includes persona poems and other poems that use humor. Tim is known as the master of the “tickle-punch” poetry, which uses humor to open up the readers, and then punch them with your message. When they recoil, you repeat the procedure throughout the poem. I’m fortunate to be Tim’s mentee as a Stonecoast MFA candidate. Ever since I found his work and reached out to him, my life and writing are taking me in directions I didn’t see coming. Thank you again for your post, Nova! Nova, this is very inspiring. I have found whole parts of my life by accident, so I know just what you mean. I am still waiting for my turning point, although it is very possible that I’ve encountered it very recently and haven’t seen around the bend just yet. I am currently reading The Writing Life by Annie Dillard and Bird by Bird by Anne Lamott. Both these books strike me almost every reading with a “Whoa!” or “Aha!” about writing. Both authors have emphasized that the key to good writing is producing a LOT of TERRIBLE writing that can then be edited and combed later. So, here’s to my production of a LOT of TERRIBLE writing until the good stuff starts to sift its way out! This was such an interesting post. The only experience of YA books I have are the Twilight books… I suppose I have dismissed them as “kids stuff”. Thank you for this- a reminder that one should not get stuck into one way of thinking and looking at things….I look forward to checking out Imaginary Girls!! I finally started a public blog a few weeks ago, till now I’d been writing in private. I haven’t written anything fictional since I was a teenager. For years my love of writing lay dormant. My turning point came last summer when I discovered that a friend of mine had a blog. A light bulb went on and I said to myself, “I could do that!” Next thing you know, I started my blog and the words are pouring out of me. This is my passion! Congrats on being FP’d! What a cool name…Nova…I love it! Thank you so much for your post and for sharing your story. We quite often hear about peoples success but, not so often, the journey by which they arrived and this is what is truly inspiring for the most of us. Looking forward to reading the book. I am not a writer but I enjoy improving my writing skills! I’m using all the books you’ve listed as a “Books My 12 Year Old Daughter and I Can Read Together” List – there’s a trip to B&N in my future…Thank you! I don’t know you, but I feel happy for you. 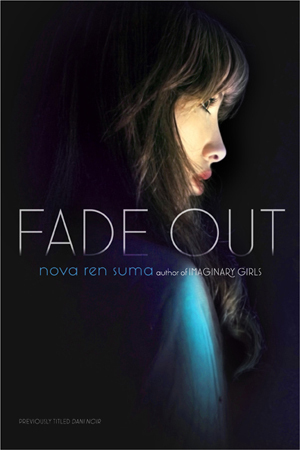 Nova, you are a heck of a writer! I’m not a writer, I am a reader. It was pleasant reading your words…The flow of smooth transition is such soft music to my eyes. I felt the same after I read Twilight! I’m not a writer and I don’t have aspirations to be but my aha moment came in this life when I was 17. I had left an abusive home to go to school overseas for a year. I was in the airport to return home. I was sobbing uncontrollably when a young soldier started to talk to me and I told him I didn’t want to go home. “You are old enough to make your own decisions.” I called a teacher who I was close to and asked if I could stay with her family. I lived with her for the next year. I never looked back and I never went home. I would love to write a novel someday, I have no prior writing experience but ideas and stories a mountain high. Where do I start? Still waiting for that Aha moment though. I think the best place to start is putting pen to paper and seeing what comes (or fingers on the keys… I admittedly type everything). Reading books in the genre you want to write in is good way to learn how to write your own. And I’m also a big fan of writing workshops when you’re just starting out: I learned so much from workshopping my stories with other writers, and I especially like having a built-in deadline. I write a little about my own Aha moment here: http://shiftersseries.wordpress.com/2010/06/03/if-youre-a-writer-and-you-know-it/. For me, it was less about genre and more about embracing the fact that I am a writer at my core. I, too, am an author of YA fiction, though it took me a while to come to the genre. The funny thing is that once I came to that realization (I write something about that process here: http://shiftersseries.wordpress.com/2010/06/22/stuff/), it was amazing how the story just seemed to burst forth from me. I took it as a sign that Interlopers: A Shifters Novel was the book that I was meant to write. Enjoyed the post. Funny how we all need a little help seeing the nose on our own faces, eh? Congrats all around and look forward to seeing you compared to your contemporary idols soon! I`m looking forward to reading your book! This is an awesome post! I love your insights about writing! Very interesting. I am an artist, but currently working as a real estate agent. My heart is in my art and I don’t seem to have the time for it now, and i find myself resenting this. I know I am an artist and that is what I am supposed to be doing, but maybe…just maybe…there is a reason. I don’t know…I wish I did. Thank you for your post. So what is a YA novel? You need to say more about that. It is a novel for young adults, i.e., teenagers. I’m curious what it was about Feathered that gave you that eureka moment. I had a kickass politics teacher in high school who had been a college professor. He said he preferred high school since he felt he could play a larger role in helping to shape and encourage bright minds. Was is something like that? Was it a realization that you didn’t have to limit the sophistication of the prose, characters or plot as much as you’d imagined? Something else? Hi, Nox. I definitely don’t think I need to limit the sophistication of the prose when I’m writing for young adults… I just need to be honest and true to the voice of the character. (I mostly write in first person.) I also don’t believe writing YA means dumbing down my writing. For me, it’s mostly that I love writing from a teenage perspective—from that moment in time when everything is so significant and new and, often, the first of its kind. It feels very alive and exciting to me. I also edited the post above to talk a bit about what it was about FEATHERED that so struck me. Thanks for asking, and best of luck to you! What a great inspiring story! I love it when you open yourself up for those “a ha” moments. I had a few in my job last year. I went with it, changed jobs, and am so much happier. Thanks for sharing your story! Thanks for writing such a wonderful article. Your words were an inspiration. I feel honored that I stumbled here, almost as if fate shoved me in this direction. Great post Nova, very thought provoking. I think the turn in my writing came recently, when I stopped thinking about the ‘publishing’ part of it, and realised that I actually quite enjoyed writing for myself. Sure, there’ nothing quite like someone telling you how much they enjoyed reading your stuff, but in the end, the greatest satisfaction comes from managing to convey something that’s been building up inside you. Thanks again for your FP, it really made me think! Amazing…I believe in everything happens for a reason and always for the best! I wish you great luck and hope to read your YA soon. Even though I had never thought of writing a novel before, I have always had an over active imagination and loved writing in grade school. That moment for me was while I was reading the Twilight saga. I remember thinking about when I was that age, and how many possibilities there were (nostalgic I guess). I wanted to tap into that energy so I started my first novel, also YA fiction. I am in the process of editing it now. I am still a very green novice, but I love the process. I love this! Thanks for sharing your turning point moment with us. Mine actually came when my friend Joelle suggested I try writing a novel, it was like I’d just been waiting for someone to give me permission. Now I can’t imagine not writing and I do wish I’d started sooner, but I guess it wasn’t the right time before. Great post! I’m off to get my copy of Feathered. Have read Boy Heaven with a similar reaction. Meanwhile, my turning point was somewhat similar – being hired in Pocket YA out of college and being all at once reminded of YA and how I had loved it as a child. I think I have had several turning points in my life, but one of the most profound happened when I transferred to Faulkner University in 2007. I had been studying history in community college for two years and had my heart set on working as a historian in a museum or on projects like “Frontier House” (PBS). Then I transferred to Faulkner and decided to try writing for our school newspaper. It was while writing my first article that I realized I was meant to be a writer and a journalist. Something clicked and I knew that this was a job I could love–something that would make me look forward to Monday mornings. Needless to say, I changed my major to journalism and worked my way up to editor-in-chief my senior year. Today I have a job working for the Air Force in the Public Affairs office and I’m working on two novels. What an inspirational blog post, thank you for sharing your turning point. I think mine was the moment i said to my partner ‘I’ve got this idea for a story i’d love to write’ and he said ‘Why don’t you?’. That three-word question made me think. Why not write the story? What did i have to lose. That was two years ago. I wrote the story (which was placed in a short story competition) and am now editing the first draft of my novel. The turning point in my life was reading Ray Bradbury. And then his interviews. He’s a wonderful speaker and anything he has to say to young aspiring authors is worth paying attention to, even if you are not acquainted with his work. Thanks for sharing your story! Life often leads us down a path in a strange way so that we may arrive where we were supposed to! Congratulations on finding your path! I think I am living in my turning point right now.I finally know what I want to do with my life. I started my blog because I realized that I want to become a writer and because I have never been able to express myself really good. But now, as I put my life into words, things are becoming easier for me. My writing has helped me and I really hope that it will help others. Thanks for sharing your turning point moment. Mine had to do with the 20th anniversary of a traumatic event. I had to do something with all those emotions I’d kept bottled up for two decades. Though I was already working on a YA novel that was all “sweetness and light” I decided to write something edgy and dark. I submitted this project for an SCBWI Work-In-Progress Grant and won! This was a huge turning point. Amongst other things, it gave me the confidence to keep writing and to keep seeking publication. Now, I must find a way to get my hands on IMAGINARY GIRLS, sooner or later.